Choosing the right wedding band is not a difficult thing, but it is a choice about what suits the couple's style, what works with the woman's engagement ring, and what fits in the budget. 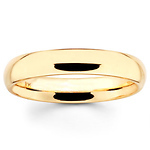 Plain wedding bands for men and women are the most popular style because they are generally affordable and versatile. 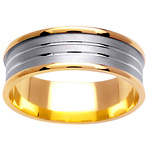 For men and women, the plain wedding band style is usually a simple band of gold, silver or platinum. 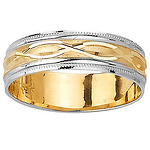 Click here to see our collection of Plain Wedding Bands. Braided, or woven, wedding rings have an intricate design of interwoven metals. This style is popular among men, especially for those who want something more than a simple men's wedding band but are not necessarily comfortable with a large band or a ring that includes a stone. 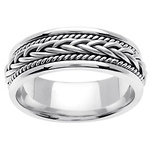 Click here to see our collection of Hand Braided Wedding Bands. Contemporary wedding bands are much as the name implies - they are usually sleek, modern, and work well alone or with an engagement ring. Because they are modern, they are often fashioned from platinum or white gold, giving a lustrous, metallic, polished look. Click here to see our collection of Contemporary Wedding Bands. Diamond rings are a very popular womens wedding bands who want to wear a thin diamond band to compliment their diamond engagement rings. Many women will also wear their diamond bands alone or without their engagement rings for a simpler, less fussy, look. Diamond wedding rings are also good for men who want a little bit of bling on their finger. 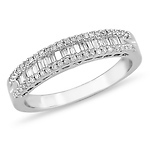 Click here to see our collection of Diamond Wedding Bands. These rings have designs etched or carved on top of the metal instead of having a lot of molded designs. These carvings can be very modern and sleek, simple, or quite ornate. These kinds of bands are ideal for both men and women who want something unique on their finger. Click here to see our collection of Carved Wedding Bands. Christian rings are often designed with a variety of crosses, bible scriptures, and other Christian references. They offer Christian couples a unique way to show not only their love for each other but also for their faiths. These bands are usually fashioned from gold or platinum, or both, and can be designed to coordinate with Christian engagement rings. 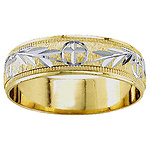 Click here to see our collection of Christian Wedding Bands. Most people will find more than one wedding band style that suits them - the real task, then, is choosing the one that they can wear for a lifetime.